Madre De Dios! More Mighty Marvel Mayhem! “A quest… You humans love quests and epics… romantic notions… absurdities which clutter your lives and distort your base realities!” – The High Overlord. “He had touched the blade of grass… and it turned to red Martian dust beneath his hands. The sand shifts through his fingers now, and Killraven knows for a certainty that the desert he kneels upon is located on the planet Mars. Killraven: ha! Now there’s a name ta die for! Anyway! Welcome back to the weird wonderful world of Bradscribe – apologies for the delay since the last Post, but things have been hectic around here. Once more unto the back issue boxes, dear friends! Undoubtedly the highlight of Summer ’16 involved delving into the treasures of Bronze Age comics – that exceedingly special time from c. 1970 (curiously estimated with the debut ish of Conan The Barbarian of all things) up until the mid-’80s (and the death of Jean Grey?) when some exceptional titles were produced. At the most, taking advantage of the opportunity to catch up with some truly remarkable writers and artists; pleasantly acquire previously unknown titles; and dip nostalgically into editions that used to belong in my bedroom but for whatever outlandish reason got lost in the mists of time has transmogrified into an enjoyable and worthwhile venture. For me, the Bronze Age happened to be the best period for comic books. Killraven – for all its faults – demonstrates how experimental and innovative Marvel Comics could be during the 1970s. “The brute still lives! Such ineffable strength and longevity are almost beyond my experience and bear further study at The Project!” – The Hate-Monger. Yes, yes, we covered that lupine moonbeast here: but that was too long ago, and quite frankly, he deserves more blogspace – for he is an extraordinary character simply never available on the Southern English newsstands of my youth. And it is a pleasure to finally catch up with his stunning series. 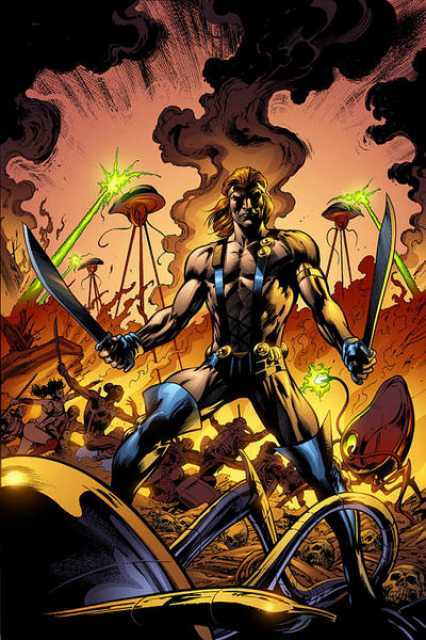 From ish #30, Man-Wolf became the sole principal star of Creatures On The Loose, until being cancelled (with ish #37 back in 1975). Ish #35: Wolfquest (May 1975) is – rip-roaring sci-fi action/adventure at its 70s best. “David Kraft wrote it; George Perez drew it; you get to read it!” says the text on the groovy front page. 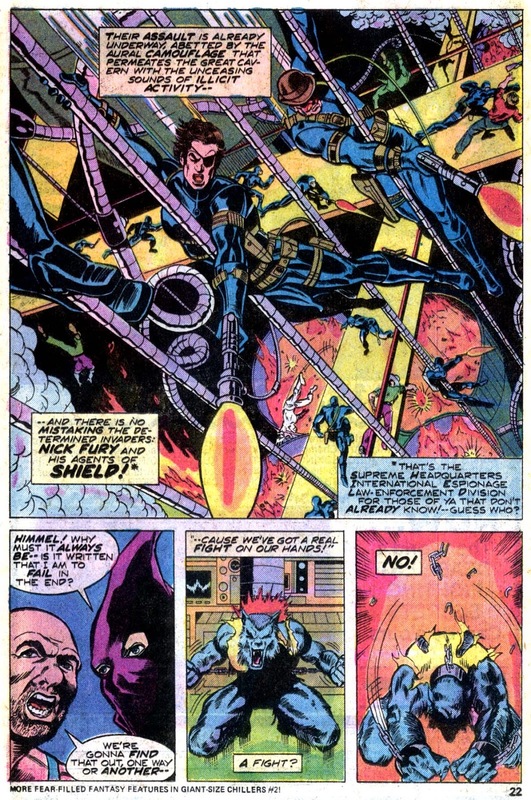 There is also an ace cameo from Colonel Nick Fury (one of my all-time fave comic book characters) – “Sonuvagun if it ain’t!” – and Dum Dum Dugan! As penultimate pages go, this – the death of the Hate-Monger is as awesome and intense as Bronze Age comic art gets – proudly loaded up here (above). Like the BA gem listed above, (The Power Of) Warlock was also cancelled in its prime, but Adam, the golden-hued character himself made such an indelible impression on my infant mind. More tragically, the original series lasted no more than just 15 ishs. 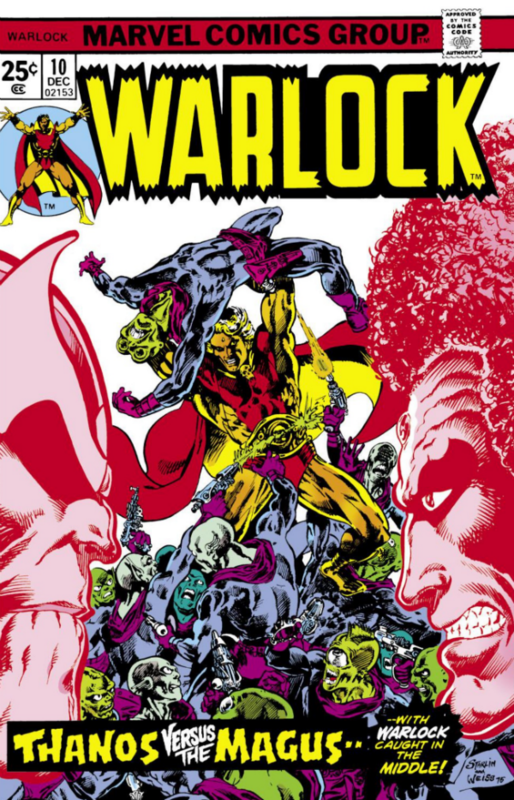 Ironically, Warlock – “By Orion!” – has attained hallowed cult status and is extremely difficult to come by; when my sensors did detect odd editions, the going rate seemed ridiculously high. So finding that immortal classic: Warlock #10: How Strange My Destiny (December 1975) (for a thankfully ridiculously low price!) proved to be an exceptional find. As Adam realizes with horror: “My mind is a cesspool of corruption that will someday spawn the Magus” – the Magus is Adam Warlock’s future self! Blimey Charley, what a humdinger! “25,000 armed Black Knights just to kill four unarmed intruders?! The Magus must be cracking up! Wish I had 50,000 instead of a mere 25,000…” – General Egeus. 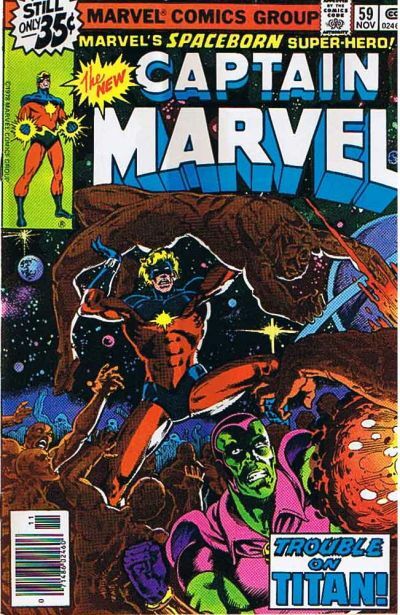 Hankering for more galactic thrills, it seemed inevitable that Marvel’s spaceborn “most cosmic superhero of all” – the original Kree warrior: Mar-Vell – would get snapped up. Eager to find out more, an excellent additional feature of Warlock #10 – an insert in which Captain Marvel explains the background (and threat!) 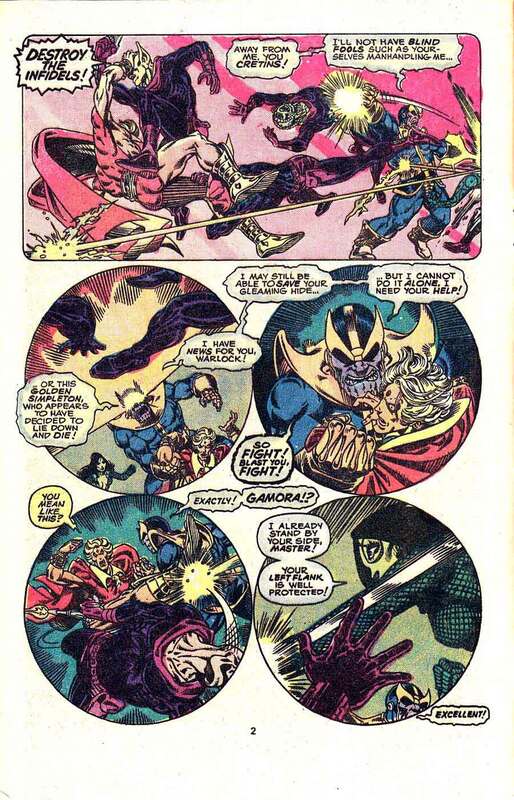 of his arch-enemy: Thanos. Usefully, it noted #s 25-33 as the classic ishs in which the two legendary characters went head-to-head. Initially, Marvel Spotlight #2 (featuring Captain Marvel) came into my hands fairly early on during this hunting season. However, Pat Broderick’s art style failed to alight the Bradmonitor. Not to be outdone, a chance was taken with Captain Marvel #59 (November 1978). 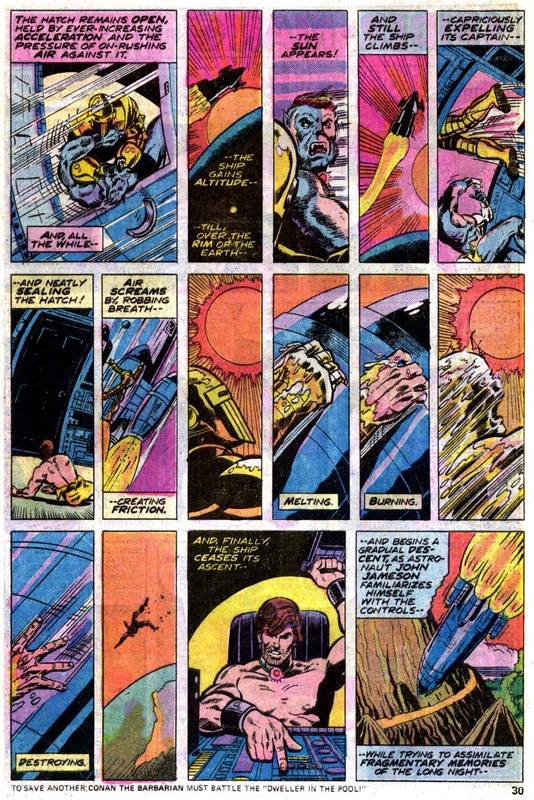 Despite retaining Broderick’s pencils, The Trouble With Titan actually offered a more satisfying look, mainly because of the special guest star appearance by Drax The Destroyer. Despite having a fascinating splash page, #35 (March 1976) is bogged down with an even more confusing plot; moreover, he grumbles, the addition of an insipid Martian character and a deranged, scantily-clad woman spouting interminable gibberish does NOT guarantee rewarding reading! So, it’s official then: Killraven is PANTS…. Not gonna let this absurdity distort my base realities! But heck! Let’s not end on a bum-note. “Alas, Iron Fist, you have my sympathy. No man should be spurned by a beautiful woman and fall in battle on the same day!” – El Aguila. Last and – well, really! Is anyone nuts enough to say: “least” to Luke Cage’s face?! 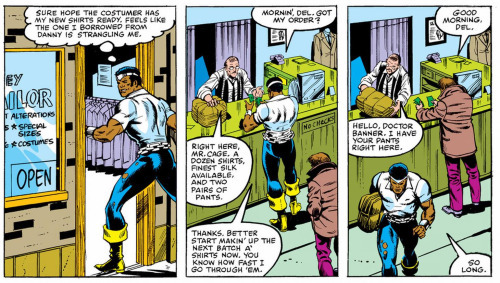 – we have Marvel’s very own dynamic duo: Power Man and Iron Fist. This is such a nifty break from my usual cosmic cravings, and besides, back in the day, one ish did pass through me grubby infant mitts, but Brad‘ll be damned if he can recall the exact one! Never fear, random back ishs have been selected, and are turning out to be an unexpected fab treat! #65: “An Eagle In The Aerie” (Oct 1980) is great fun. 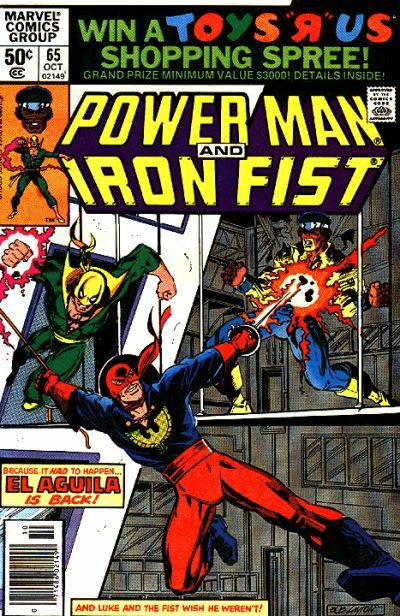 En route to the Aerie (HQ of Heroes For Hire), Luke and Danny are followed by old adversary: El Aguila and – “Santa Maria!” – half the staff of all-female guards have revolted and all three costumed heroes have to defend the Aerie from all-out assault. Before Luke and Danny can get a word in, the Eagle escapes in a helicopter, but not before smooching the secretary. Been searching for ish #58 (El Aguila’s initial appearance) but – not surprisingly – it is rare and expensive. Originally, this Post began back in September(! ), revised in November, but it has taken the last few gruelling days just to finally launch this draft – well, anything really! – into the blogosphere. Relieved, rather than pleased, to have accomplished some writing again. Meanwhile, quite a considerable comics collection has amassed here over the past few months – therefore CANNOT WAIT to discuss, in a flurry of forthcoming Posts, the juiciest finds with you! …is where you’ll find me: the “Leisure Hive” @ Brad Manor. “I’ll bet any quantum mechanic in the service would give the rest of his life to fool around with this gadget” – Chief Engineer Quinn. A New Year = A New Hope? Brad may be an idiot, but he’s not foolish to believe that the travails of one rotten year are all going to magically dissipate as soon as a fresh one begins, but behold! Aah, the healing power of music, especially the electronic kind. Having sought to prepare this Post for some time and – considering how hits of yesteryear usually slip back into my post-Christmas playlist every year – here it is! For TV’s longest-running SF series: Doctor Who, Delia Derbyshire of the BBC Radiophonic Workshop transcended tech limitations by tape-splicing the sounds of tone generators. In 1972, mechanical experiments in sound texturing were afoot in Germany. Combining backwards guitar overdubs with chiming synthwaves, Neu! launched the subgenre that would become known as Kosmische Musik (dubbed somewhat disrespectfully as Krautrock by a disapproving UK press). The early 1970s also saw the emergence of the ultimate electro-pioneers and shapers of the future: Kraftwerk. Their man-machine trope and their innovative creation of synthesized instruments for their “robotklang” were as far removed from the mainstream as you could get, but provided the template for electronic musical progression for many years to come. Other experimental acts in this wonderful Kosmische canon include Popol Vuh and Can, providing their own unique spaced-out sounds. Could Have Played: Anything by Tangerine Dream, Neu!, Kraftwerk, Cluster or Can et al. “We are doing intellectual research on electronics… We really like to show how modern, sophisticated equipment can be used today in order to create a futuristic sound” – Edgar Froese. Could Have Played: David Bowie – V2 Schneider, Neukoln or Moss Green. “I’m not an original thinker. I am best at synthesizing things… I’d like to think what I did changed the fabric of music” – David Bowie. Being on Earth, but not being of it resonated with the late, much-missed Starman: David Bowie. Space travel and aliens (more specifically alienation) rolled recurrently throughout his lifetime (of) achievement. 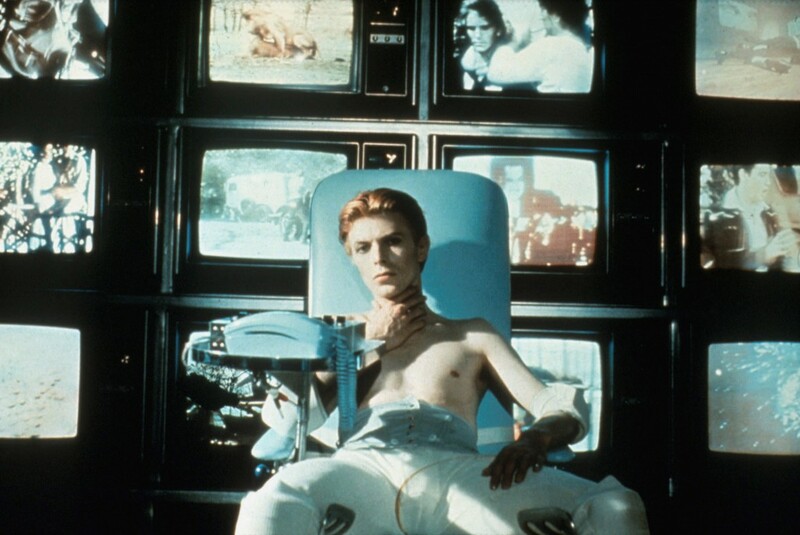 In The Man Who Fell To Earth (1976) he appeared cold, emotionless and detached, because that’s exactly how he felt at that point. In collaboration with ambient wizard: Brian Eno, he felt compelled to dabble in soundscapes, encouraged by the possibilities that different sonic textures could achieve. “I was a big fan of Kraftwerk… and I thought the first Neu! album, in particular, was just gigantically wonderful…” Bowie remarked, reminiscing about this special time in his life. Electronic music certainly revolutionizing his approach to music-making. Low and Heroes – both released in 1977 – form distinctive high points in what appears today as such a sumptuous discography. Bowie’s instrumentals contained the breath-taking results of his Kosmische-inspired aspirations to make “expressionist mood pieces.” The track: V-2 Schneider was an ambiguous homage to Kraftwerk; Edgar Froese’s Epsilon In Malaysian Pale directly inspired Moss Green; while there is a hefty nod to Neu! in Neukoln; and how much of Neu!’s Hero can you hear in Bowie’s landmark single: Heroes? Even as late as 2013, nostalgic reflections of his time in Berlin graced the incredibly moving single: Where Are We Now? “To me a career is just like a machine. All the pieces have to fit together perfectly or else the machine will tear itself apart” – Gary Numan. With the rise of electronic music during the 70s, SF sounds soared into a whole new system. One of the pioneers of electro: Giorgio Moroder revitalized the career of disco queen: Donna Summer. I Feel Love became the first fully-synthesized (playing no trad instruments) No.1 pop single in 1977. Up to the end of the 70s, and well into the early 80s, numerous acts such as Ultravox, the Human League, OMD and many others continued the man-machine SF theme and never failed to dominate the charts. Meanwhile, in the film world, John Carpenter contributed his own distinctive mark on the history of electronica by composing scores for his own films: most notably Halloween, Escape From New York and The Thing. Numerous electronic film scores emerged during this period, but probably the greatest masterpiece in this field would have to be the soundtrack for Blade Runner by Vangelis. “Everyone Needs A 303” – Fatboy Slim. With the onset of the 90s, electronic music branched off into experimental subdivisions such as house – and of course techno (a mighty subgenre in itself, shortly to get its own post here!). The whole scene was transformed by one unlikely piece of equipment: the Roland TB-303: a bass synthesizer (with built-in sequencer). DJs and electro musicians in Chicago experimented with this device and created acid techno (which thrived in the UK and Europe as well). Look again to Germany and the Tresor record label offered a quite considerable coterie of the next stage in intriguing artists such as Regis, Surgeon and Pacou. One of the most remarkable producers on the current German scene is Wolfgang Voigt, aka Mike Ink, aka Studio 1. aka Gas etc etc! In the early 21st century, advances in digital tech allow for more complex soundstructures of diverse techno. Perhaps it is fitting that we arrive at a recently formulated subgenre referred to mainly as retrosynth (or synthwave) which marvellously recreates that analogue 80s style. Of the numerous artists working now, none is more impressive – and best prepared to reach for the stars – than Lazerhawk.